"Useful Tips for Using RFID for IT Asset Management"
Radio frequency identification (RFID) technology has evolved significantly, from a niche technology to a widely adopted asset tracking and identification solution for better RFID asset management. RFID technology is providing new levels of visibility, enabling new applications and opening new markets. 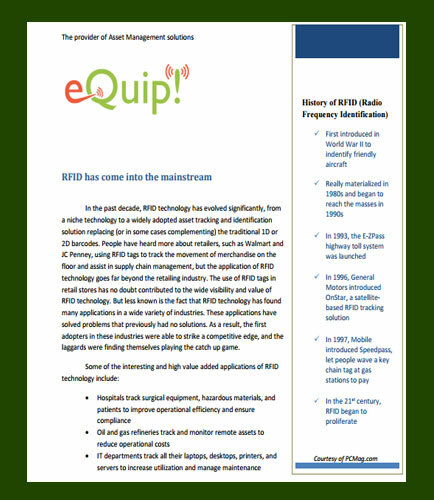 This white paper on RFID technology provides insights on how RFID asset management have solved problems that previously had no solutions enabling businesses to analyze the data and make decisions quickly to improve asset performance and operational efficiency. What is RFID (Radio Frequency Identification)? How are RFID tags different from regular barcodes? What should you be looking for when you have decided to use RFID asset tracking technologies? What does RFID mean for enterprise asset management? What are the services provided by RFID asset tracking technologies? What is Enterprise Asset Management ? Enterprise Asset Management (EAM) is the optimal and sustainable lifecycle management of the physical, financial, human, information and intangible assets of an organization. EAM also refers to the technology -- EAM software -- to enable that management in the most efficient and optimal ways possible. What is Asset Monitoring ? Asset monitoring refers to the technique of tracking permanent or changeable material possessions through the use of a GPS mechanism that broadcasts their site. A monitoring tool is affixed to a high-value quality and is configured to detain and communicate important information, making it available from a distant site.